The fresh blueberries burst with flavor when baked in these scones, and are further punctuated with a sweet, lemon glaze. With a food processor, the scones are mixed in just a few minutes and are ready to eat straight from the oven. We recommend these scones for a proper afternoon tea, but find them equally suitable for breakfast or a weekend brunch. 2. Measure all of the dry ingredients (flour, sugar, baking powder, baking soda, salt) together in a large bowl. Mix the dry ingredients well so that all elements are evenly distributed across the mixture. 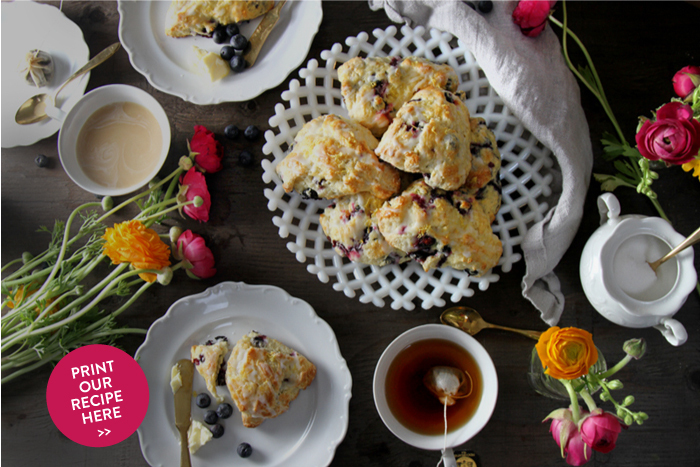 If mixing the scones by hand, a whisk or broad spatula will accomplish the job easily. If mixing with a food processor, pulse the dry ingredients a couple of times to mix the dry components. 3. Grate very cold butter with a coarse grater. If mixing scones by hand, the butter may be incorporated into the flour by (1) using a pastry blender, (2) employing two knives in a scissors motion, or (3) by hand with quick pressing motion. If mixing with a food processor, add the grated butter to the flour mixture in the work bowl. Pulse a few times until a coarse crumb results. 4. Add, by hand, the blueberries and lemon zest to the dry mixture, and stir until evenly distributed. 5. Whisk together the buttermilk, egg, lemon juice, and vanilla extract in a separate bowl. From here, we suggest mixing scones by hand. Add the liquid all at once to the dry ingredients in a large mixing bowl. Mix using a folding motion with a large spatula. Do not over mix; the dough will be shaggy in character. Turn the dough and scraps out onto a lightly-floured working surface. 6. Using a light touch, bring the dough and loose scraps together, and gently gather into a single mass. Push the dough around a bit, folding it over 5-6 times. That’s it, no more. Too much kneading will activate the gluten in the flour and result in a tougher scone. Use just enough flour to keep things from sticking, but as little as possible. 7. Pat the dough into a circle with a thickness of about 3/4-inch to 1-inch. Use a dough cutter to cut the dough into 8 wedges. Brush the scones with an egg wash. Place the scones a few inches apart on a parchment-lined baking pan on the middle rack of the oven – if too low, the bottoms may darken; if too high, the tops may brown to quickly. Bake for 13-15 minutes. 8. While the scones cool. Whisk the glaze ingredients together, adding the lemon juice slowly until a good drizzling consistency is achieved. Use a whisk to drizzle the lemon glaze on the scones. If desired, sprinkle additional lemon zest on top of the glazed scones. Enjoy while still slightly warm.